Get the most value for your money with this Top-Rated Professional Grade Cooking Equipment! This professional Nonstick Saucepan is made of professional-grade 3003 Aluminum Alloy. Its 2-Layer Nonstick interior is exceptionally durable, double quoted and scratch resistant. Its sturdy Bakelite Handle is strongly riveted to the pan to create a comfortable grip. 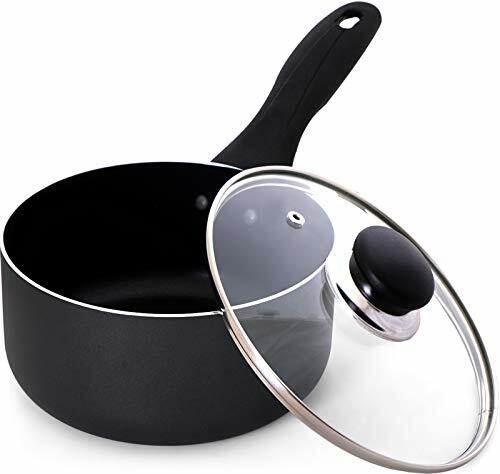 Two layered nonstick interior is exceptionally durable, double quoted, and scratch resistant; sturdy heat resistant bakelite handle is strongly riveted to the pan to create a comfortable grip. Delivers scrumptious results, whether you're making sauces, gravies, boiling pasta, or simply reheating leftovers.